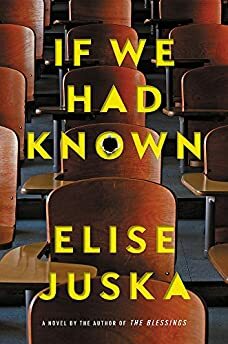 Largehearted Boy: Elise Juska's Playlist for Her Novel "If We Had Known"
Elise Juska's Playlist for Her Novel "If We Had Known"
Elise Juska's novel If We Had Known is a timely and important literary page-turner about a mas shooting at a mall. "Switching between viewpoints, Juska contrasts the actions of a split second and the slow burn of a lifetime of behavior to show that both can have extensive, damning consequences that are rarely foreseen." My three-year-old's favorite thing to watch is a YouTube video about musical instruments. "Music is everywhere," the narrator intones. He goes on to name the places music can be heard—in the wind, the rain—and the range of feelings it can evoke. This music is peaceful, my son will often report when listening to a song. This music is silly. Serious. Sad. The novel is written from multiple points of view—including Maggie Daley, the shooter's former English professor, and her teenage daughter—and traces the ripple effect of this tragedy as the characters are impacted in different ways; for each, I chose a song whose lyrics (or absence of them) reflected their particular emotional state. Though the novel takes place in Fall 2015 and is decidedly contemporary, writing it—and, later, thinking about this essay—coincided with a household cleaning project: digging through a formidable pile of old boxes from my mom's attic, which included hundreds of cassettes. Many of these were mixed tapes from high school/college/grad school, roughly 1988-1997, carefully curated playlists with titles like Music for Driving or Songs for When You're Down. As I sifted through them, I remembered the songs instantly and viscerally, music that at the time was lonely, heartbroken, confused—a counterpoint to my own teenaged angst and that I listened to repeatedly, as if scraping at a wound. Now, February 2018, as I watch the news of the horrific shooting at Marjory Stoneham Douglas High School, returning to these songs evokes something more than nostalgia. It's freighted with a deeper grief—not just that my own high school experience is over, but that the experience of high school is changed, gone in a larger way. Because of the convergence of these things—the news, the novel, the obsolete mixed tapes—some of those songs found their way onto this list. In the opening pages of the novel, as news of the shooting emerges, one of the first lines of inquiry is who the shooter is and why he did it. I have a clear memory of this Boomtown Rats song coming on the radio of our Datsun when I was ten or eleven, and my dad explaining that it was written about a shooting. That the shooter, upon being asked why she did it, replied: "I don't like Mondays." Maybe it's because this response, in the ordered world of my childhood, was so warped and disordered that I remember the moment so vividly: sitting at a red light, looking out the window, trying to wrap my mind around this senselessness. Upon hearing about the tragedy, Maggie immediately realizes the gunman, Nathan Dugan, had been her student. She later discovers something he wrote for her freshman composition class, four years prior, that may have signaled he was violent. A devoted teacher who prides herself on her ability to detect subtext and subtlety, it seems impossible that her eye for language might have, in this instance, failed her so critically. This Yo La Tengo instrumental evokes a summer night—not unlike the August night, quiet and mournful and even ironically peaceful, when Maggie is processing the news—and has no words. Anna, Maggie's daughter, has suffered from anxiety since she was a child. On the weekend of the shooting, she's about to leave for college and is in a relatively stable place. But the news of the shooting and subsequent flood of discussion on social media gradually reignite her old worries, as her "kid fears"—scenarios that used to frighten her but seemed ultimately abstract, impossible—have turned real. Suzanne, the wife of a professor at the college, suspects her husband is having an affair but can't bring herself to ask. When the victims' names are released—one of them a teenage girl with whom Suzanne had a brief but deeply affecting conversation a few months prior—it levels her, and she's no longer willing or able to ignore the realities of her own life. Luke, another former student of Maggie's, took to social media after the shooting, writing a quick, unfiltered Facebook post about his memories of his classmate Nathan, his guilt about not befriending him. Though Luke doesn't expect anyone to notice, his post unexpectedly and unsettlingly goes viral. Suddenly he's connected with thousands of strangers, immersed in an online world of his own creation, but feels only more isolated, stuck, strange. Marielle, the shooter's mother, disappears inside her house in the weeks following the tragedy, trying to reconcile her grief for her son with her horror at what he's done. "Your Ghost" is a lament, as she mourns the loss of her boy—or the boy she thought she knew—and is haunted by one that he became. Despite the loneliness and unreality of the online world—and the fear and anxiety of the real one—some of the characters in the novel are ultimately able to move forward, form new and meaningful connections. "Put out the fire in your head," the song says, just a voice and a guitar. "You are not alone." This music is sad. But hopeful.